First Sedona, Arizona. Well….we were not expecting what we found. With all the hype that everyone talks about Sedona, we were anxious to get there and explore. We’ve been trying for a couple years now to get to this town but things just never lined up quite right. This time, we left Cottonwood early (Sedona’s only a half hour drive) so we would have the whole day to explore. The drive in to Sedona was beautiful. The red rocks and high peaks, gorgeous. When you get into town, not so much. While we were there on a weekday and it was not crowded, we did find it more difficult to get around than we had thought. 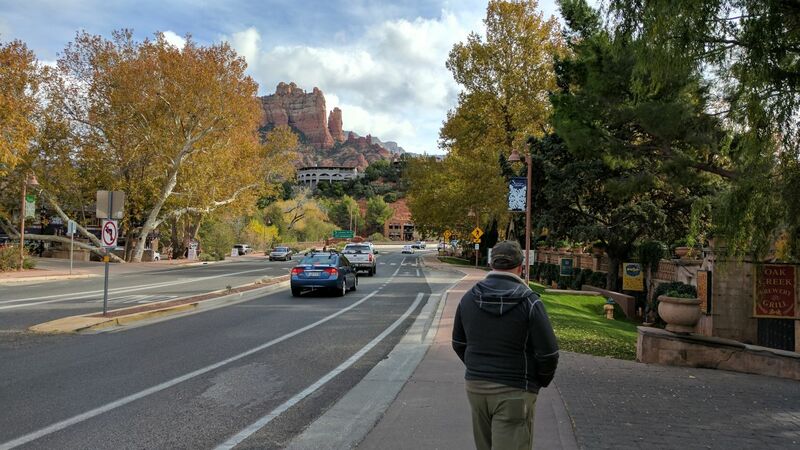 We were hoping to just park and stroll around the streets but the way Sedona is laid out, you really do need a car or you’ll be walking quite a bit. The thing that disappointed us most about Sedona was how touristy it was/felt. There was this one area of shopping that you could get out and walk around easily, but the shops were filled with cheap t-shirts, magnets and trinkets galore. There were booths set up on the sidewalk to take Jeep tours and helicopter tours and all sorts of tours. And let’s face it, if you have been to Sedona, you know how expensive everything is/can be. We looked around for a place to have lunch and it was crazy the prices they were charging out there. Too touristy for us. We ended up leaving Sedona and having lunch back in Cottonwood. As far as Sedona, we feel we were disappointed with what we thought we were getting into. The surrounding area, yes, a definite great place, great hiking. The town itself, we don’t see a need to go back. Thanks for your comments. Some of you more than likely came here based on someone mentioning this post somewhere as you surely do not seem to bereaders of an RV travel blog. If you were, you would clearly know that we go everywhere and post about everything and we call it like WE see it. We all have our opinions and that is what makes traveling great as well as being about to write about the experience. We have been doing this from 2008 and are one of the top RV travel blogs. Yes, our experience was less than wonderful with the town that we had built up in our heads as something more. This build up more than likely is from the marking your town does. (So kudos to them.) But it is that same town that let a Del-Sol, a worldwide, only found in tourist areas, t-shirt place setup shop so that says something about direction. When you are then flooded with people trying to get you to take tours and come to a time share, again, tourist area comes to mind. You want a better experience to be posted, ask your town tourist association to clean up on that type of experience and ask the tour companies to better reflect the town and area with colors that fit the area. There are rules for the buildings and how they must look, the same should be true for the businesses. We do applaud not having major chain restaurants as we always seek out mom and pop places to eat as that we find is the best experience. And yes, some good food can surely be had! You know also what we kind of found interesting in the comments made, it seems that the only ones disagreeing with us, for the most part, is the local business owners or workers that somehow found this post. This blog gets picked up all over the Internet in may areas that deal with RV and traveling and looking at comments in other places, well, we seems to have hit it mostly on the head so it is not just us. When people tend to agree with liking a small ghost town like Jerome better than a major stop with all it’s marking that draws people in. That says something. Yes, Sedona has some great views, great trails, great art and that is what we came for. However that was quickly ruined, for us, by what is allowed to take place by the town. Thanks again for taking the time to comment on behalf of Sedona. You do have some nice points. Jerome, Arizona on the other hand was wonderful. We read that this was an old Copper mining town and now they tout it as an old ghost town. Well…it is an interesting old town that is nestled inside a mountainside. Ghost town, I’m not so sure of as it still is a working town that people still live in. The drive up to Jerome is incredible. The views are a plenty and when you get closer, their is a great pull off scenic overlook area that you really can see the whole town and the Copper mines below. At the scenic overlook it also has some signs telling you the story behind Jerome. Jerome was actually cut out of the mountain. So the streets run literally up and down the mountainside. It’s an easy town to get out and walk around but remember that when walking, you are at a higher elevation than you were in Cottonwood where you started. Plus, the hillsides and the steep inclines of the streets make for quite a little hike.Due to the 30-degree incline of the mountainside, gravity has pulled a number of buildings down the slope. A lot of great information can be found here about Jerome and it’s history. We very much enjoyed walking around this town. So much so, we went back a couple days later. The views alone are totally worth it. The quaint little shops were good and we did not get that touristy feeling, even though this is a “tourist” town. 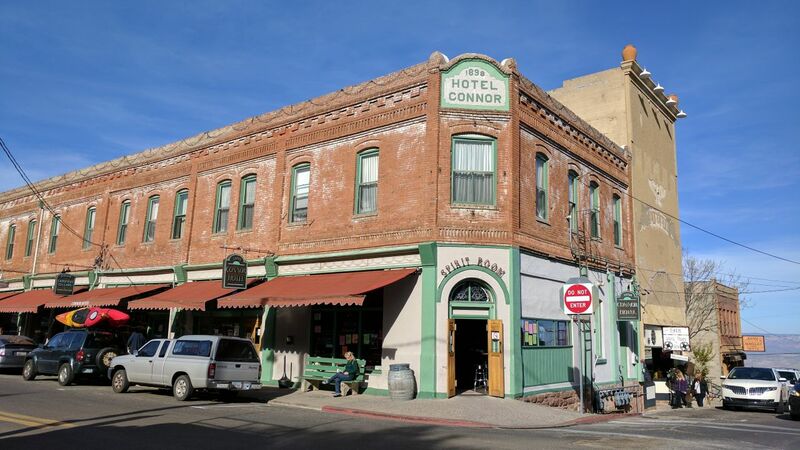 One of the really interesting things in Jerome is all the old historical buildings. They are everywhere up there. One neat one we found interesting was the old Liberty Theater. 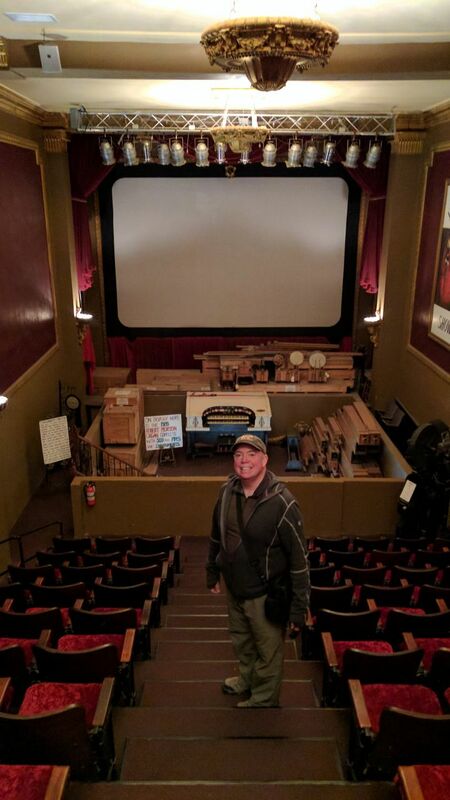 It was the original theater that opened in 1918 and featuredsilent movies and vaudeville acts. It was passed around to different owners and eventually sat empty for years until the current owners bought it and are in the process of restoring it to its original glory. 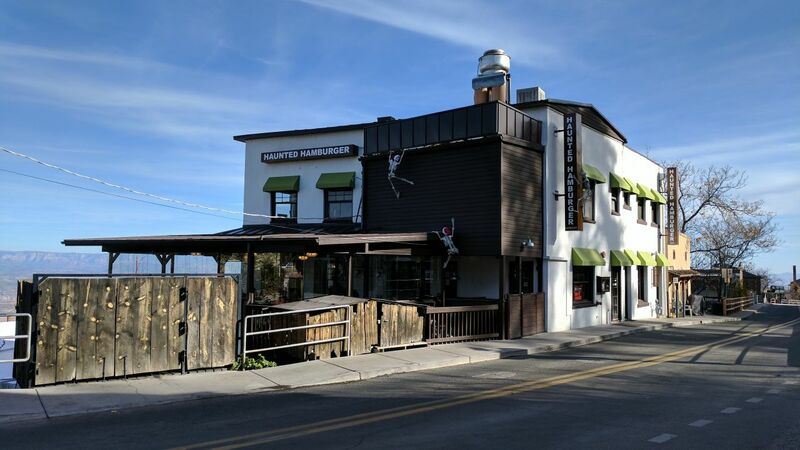 There are quite a few restaurants in Jerome and the two that we went to were both good. The first day we went to Grapes, a restaurant that was the original Pony Express Station back in the early 1900’s. They have good food and they help you pair local wines to your order. However the next time we went up to Jerome we found Haunted Hamburger. It got great reviews online and it certainly did not disappoint. 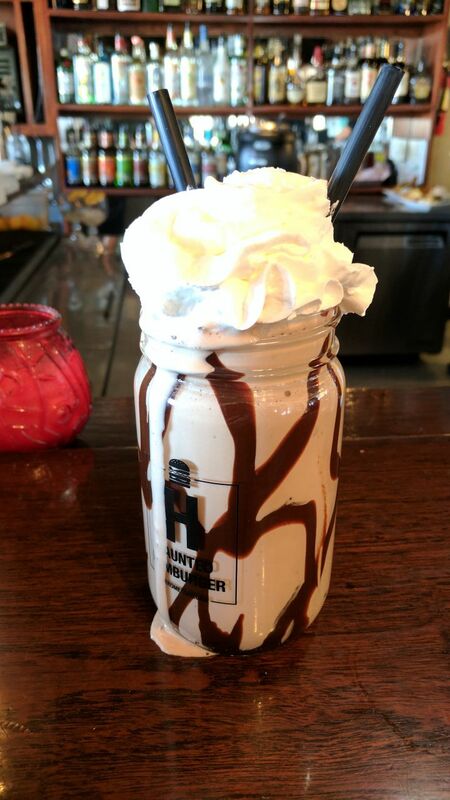 Their burgers were wonderful and they make a super yummy shake that was plenty to share. 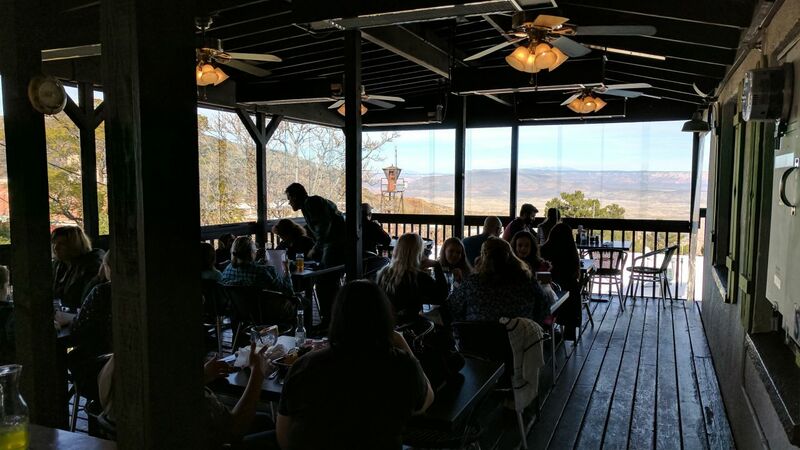 They have a wonderful outdoor patio with a great view of the Verde Valley and the San Fransisco Peaks that are 50 miles away! It was a bummer that the outdoor patio was full when we went there. We ended up sitting at the bar for lunch. Which is not bad because everywhere you sit in the restaurant, you can still get a great outdoor view with their giant floor to ceiling windows. So would we go back Jerome? Yes, for sure. We very much enjoyed Jerome and all that it had to offer. 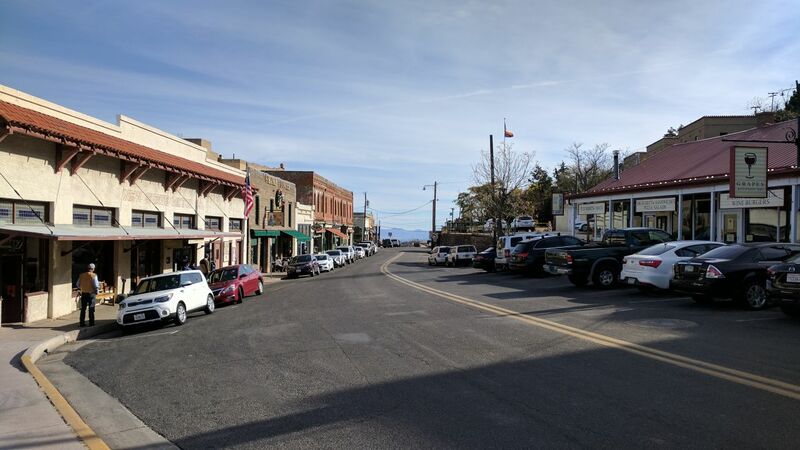 In the two days that we spent exploring Jerome, we never did get to the many museums and historical parks that they have. We had to save something for next time after all. We feel exactly the same way regarding downtown Sedona. When we’ve been there, we boondocking outside of town about halfway to Cottonwood. Then, we pick and choose WHERE in Sedona we want to go to. Some we like, most we don’t. We like the feel of Cottonwood. We need to get back to Jerome. And then on the other side of the mountain, we like Prescott. 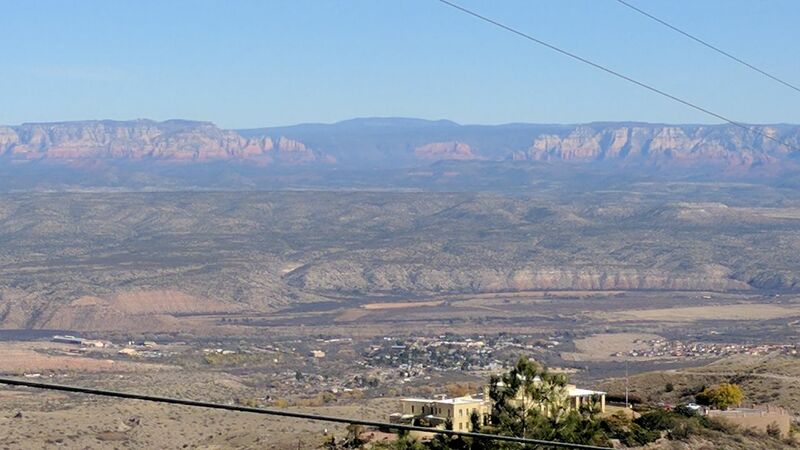 Sedona Shmedona, its not the town you go to see, Its the Red Rocks or Oak Creek Canyon or to visit the Wineries down Page Spring road in the little towns like Cornville or Page Springs. That’s where the real beauty is. Sedona itself should have been built on the freeway like all tourist traps. We used to live in the Phoenix area and “going to Sedona” was always the thing to do. But I don’t think we ever went to go to town. We went because it was cooler and the scenery around town, and the great canyon to the north of town. Don’t know what it’s like these days, everything in Arizona seems to change a lot. Sorry you were so disappointed in the visit. We live about 90 minutes East of Sedona in a small town called Payson. We have visited Jerome and Sedona many many times and have had similar reactions to both places. However, it should be mentioned that the off-roading trails in the Sedona area are spectacular. The views and opportunities for photos are great. If you have a 4-wheel high clearance vehicle the “pink jeep” tourist places usually don’t mind if you follow them when they conduct tours. Just ask before you do. The artsy stuff in Sedona is very good quality if you are looking for such. One just needs an open mind and if the T-shirt type stuff is not what you are looking for then just pass it by and check out the stuff that does interest you. By the way, if you are still in the Cottonwood area suggest you visit the animal park called “Out of Africa” they do a great job showing animals that are native to Africa. Thanks much for your postings. We were staying at Camp Navajo in Williams, Az when we went down and spent part of a day in Sedona. We really enjoyed the ride down into the place, beautiful scenery, Slippery Rock and the red cliffs. Were a little put out at the high pressure fellows trying to get us to go for a visit to a “time share” nearby…almost caved, but finally held our ground. Was a “one-time must do” place to go. Tuzigoot right outside of Cottonwood is an interesting place to visit with the foundations of ancient inhabitants you can walk through. Also the Pilatki Ruins have remains of cliff dwellers. We were disappointed by Sedona too but were impressed by another former mining town Oatman AZ. Don’t try to take your RV on the old route 66 into town due to the length limits and steep grades. We live an hour or so west of Sedona and have been there many times. Mostly passing through or stopping for a bite to eat or meeting someone. There is some good hiking just outside the town but you need a parking pass and my knees don’t allow that. Jerome on the other hand is full of history and old history. We have toured the Gold Mine and the State Park located there. It is worth a visit but don’t take an RV there. Thanks for your post. I loved Jerome!!! Favorite part of my trip to Sedona. So glad we decided to take a last minute day trip there. Would love to go back. Hi…Thanks for the reply. Nope, did not write off Sedona people at all. Nice people for sure. We did mention in the post about the nice trails etc as we did that also. We just did not like the town itself as it is all tourist driven. From the people trying to get you to take tours to the tour jeep them selves killing the view in the big pink off road rigs. Even hiking the number of people you run into on the trails does not make it very “nature” like. But you are correct, the views are wonderful. Also the art is fantastic! Hi… We did mention in the post about the trails etc as we did that. We just did not like the town itself as it is all tourist driven. From the people trying to get you to take tours to the tour jeep them selves killing the view in the big pink off road rigs. Even hiking the number of people you run into on the trails does not make it very “nature” like. But you are correct, surrounding areas are beautiful and up lifting. Also the art is fantastic! Wow really you didn’t love Sedona? 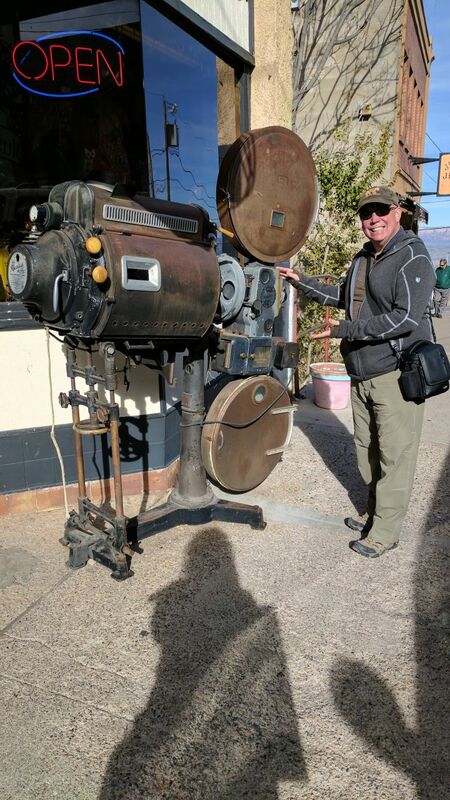 We just spent a week in the area over Christmas and loved both Sedona and Jerome. Sedona has so many well maintained hiking trails. There’s a museum north of the main shopping area of Old Town that gives you a beautiful history of the area. We went hiking and sight seeing even during rain and snow. The people who worked in town were so nice and helpful. We also visited Montezuma’s Castle, Tutzigoot Monument, Grand Canyon and Jerome. 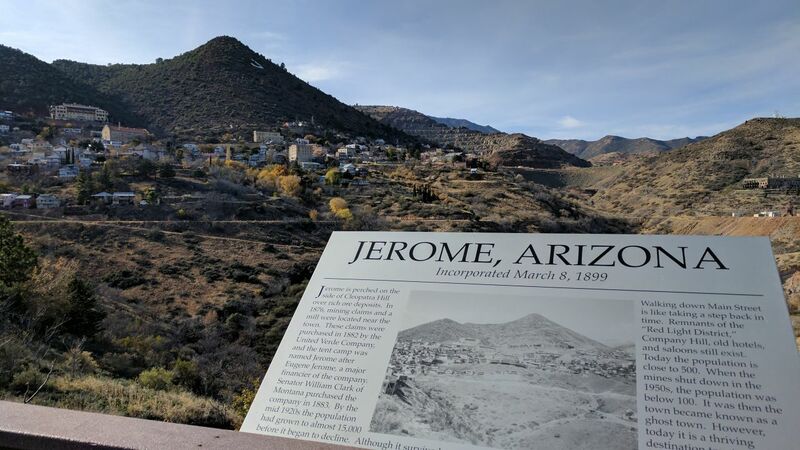 Jerome’s historical museum gives you an awesome view of the town and it’s history. We too ate at the Haunted Hamburger and enjoyed every bite. Jerome reminded me of a town that snow globes are modeled after. Maybe you should give Sedona another chance? The visitors center has tons of maps of hiking trails and inexpensive things you can do and see. Grab a picnic lunch at Whole Foods and hit the trails? We did mention in the post about the trails etc as we did that. We just did not like the town itself as it is all tourist driven. From the people trying to get you to take tours to the tour jeep them selves killing the view in the big pink off road rigs. Even hiking the number of people you run into on the trails does not make it very “nature” like. Loved the snow globes comment. :) Also the art is fantastic! 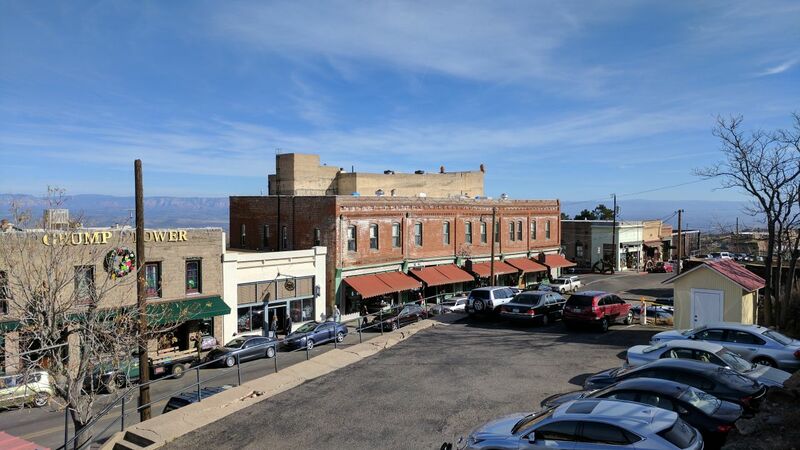 I enjoyed your great comments about Jerome — I’ve always loved my time in this great little town. But I’ll admit I took exception to your quick dismissal of Sedona. Exploring Sedona isn’t about going to the downtown area of Upper Sedona or even about getting caught up in other touristy spots. Feeling the true beauty of Sedona is spending time along Oak Creek (whether thats in the canyon, in town, or at Red Rock Crossing.) Learning the awesome majesty of Sedona comes from hiking along miles of well-marked trails or taking a jeep ride up Schnebly Hill or just sitting on a mountain ledge while basking in its eye-popping beauty. I’ve been going to Sedona since I was a boy. While the area has grown, it still has its small town charm and I love every minute of every experience when I’m there. And contrary to another comment, there are many places for a cheap lunch–just ask someone local and they’ll know. I often end up in West Sedona or sometimes the Village of Oak Creek. I’m hoping you’ll give Sedona another chance very soon — experience it all; you won’t regret it. We did mention in the post about the trails etc as we did that. We just did not like the town itself as it is all tourist driven. From the people trying to get you to take tours to the tour jeep themselves killing the view in the big pink off road rigs. Even hiking the number of people you run into on the trails does not make it very “nature” like. When you are off road and run into a tour of jeeps, well, that is not what we surely came for. :) Otherwise, yes, it has some wonderful areas to view and reflect. 20 years ago my husband and I spent an afternoon in Sedona while visiting his father in Phoenix. We drive to the Grand canyon. We stopped in Sedona. I totally agree with your assessment. It was a touristy then and not for us. The area all around it are fabulous and we spent more time out of Sedona than in it. But we did stop at an Antique store where my husband bought me a beautiful compact with mother of pearl. It’s one of my favorites in my collection. If we ever make it back to Arizona, Sedona will not be on our revisit list. Most people come to Sedona for the hiking, scenery, art galleries, spas and spirituality, not the t-shirt shops, but I’m pretty sure you find t-shirt shops everywhere you go. Some restaurants here are a little expensive but you usually get what you pay for and you can’t really review what you never tried. 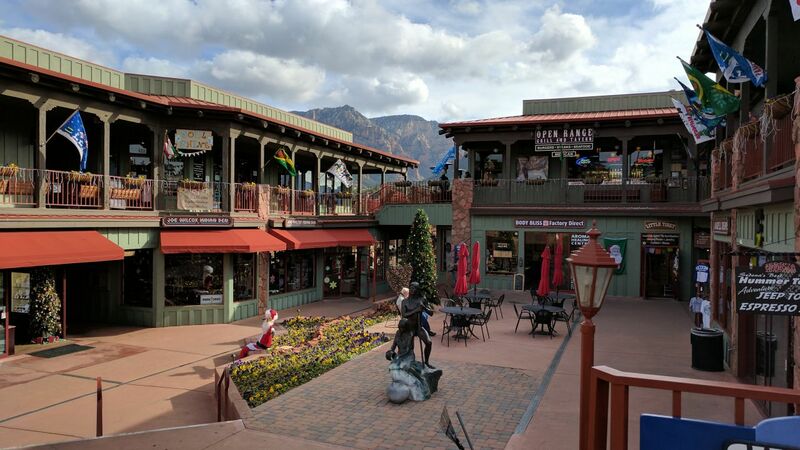 We have lived and owned businesses in Sedona and the Village of Oak Creek for over 4 years now and I’ve never spoken to a tourist that had your impression of this area, usually people are disappointed that they only set aside a day for Sedona and they are going to plan their next vacation in Sedona instead. I don’t know what you were expecting to find here but I feel sorry for you that you were disappointed with your experience. Believe it or not, touristy things do tend to occur in a tourist town. It is unfortunate that there are so many pink jeeps but you must realize that this town survives on tourism and the pink jeep tours are popular because people get to see things that you cannot see from the road. The pushy tour sales people are from timeshare companies and it is their job to entice tourists to attend timeshare seminars in exchange for cheap or free tours. If people didn’t enjoy coming to Sedona on vacation then there would be no timeshares here but obviously that is not the case. If you are going to blog about a place and give people information about it then you should fully experience it otherwise don’t comment on it. 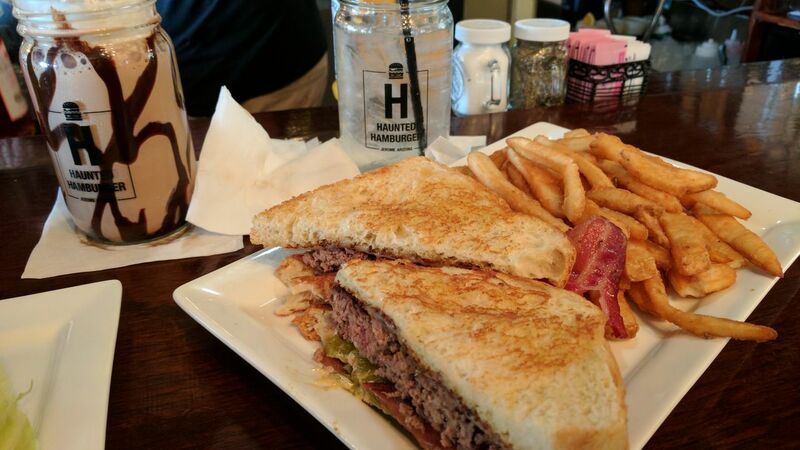 There is a sandwich shop behind 89A in Uptown Sedona that has amazing sandwiches that are usually too big for one person to finish for under $8 with homemade, fresh baked breads and fresh sliced meats. They are only open 4 hours a day and when they run out of products they are no longer offered the rest of the day. You may have noticed the lack of big chain restaurants on your quick trip through Sedona and that is because our City Council tries very hard to protect the smaller Mom-and-Pop Shops here in Sedona in order to provide a more unique experience for visitors. Because of that we have some amazing restaurants here. Those of us who live here appreciate the small town environment despite the massive number of tourists who visit and we welcome them all because that is how most of us earn our living. If you don’t enjoy places that tourists visit then you may want to rethink your trips and stay away from tourist areas. Give Sedona another try with a more open mind sometime and you may just be surprised. Thanks for your comment. You more than likely came here based on someone mentioning this post somewhere as you sure are not a reader of our travel blog. If you were, you would clearly know that we go everywhere and post about everything and we call it like WE see it. We all have our opinions and that is what makes traveling great as well as being about to write about the experience. We have been doing this from 2008 and are one of the top RV travel blogs. Our experience was less than wonderful with the town that we had built up in our heads as something more. This build up more than likely is from the marking your town does. (So kudos to them.) But it is that same town that let a Del-Sol, a worldwide, only found in tourist areas, t-shirt place setup shop so that says something about direction. When you are then flooded with people trying to get you to take tours and come to a time share, again, tourist area comes to mind. You want a better experience to be posted, ask your town tourist association to clean up on that type of experience and ask the tour companies to better reflect the town and area with colors that fit the area. There are rules for the buildings and how they must look, the same should be true for the businesses. We do applaud not having major chain restaurants as we always seek out mom and pop places to eat as that we find is the best experience. And yes, some good food can surely be had! You know also what we kind of found interesting in the comments made, it seems that the only ones disagreeing with us, for the most part, is the local business owners or workers that somehow found this post. This blog gets picked up all over the Internet in may areas that deal with RV and traveling and looking at comments in other places, well, we seems to have hit it mostly on the head. When people tend to agree with liking a small ghost town like Jerome better than a major stop with all it’s marking that draws people in. That says something. You are correct that I am not a reader but rest assured there is no grand conspiracy here. I saw this as a story that Google thought I may be interested in this morning on my Google App screen on my phone so I chose to read it and was just very surprised by your opinion as I have never had anybody tell me anything like you posted. I fully agree that everybody is entitled to their own opinion and everybody has different tastes. I come from the East Coast and grew up RVing as a kid with my Grandparents a lot in North Carolina as well as many areas from Florida to Niagara Falls and I love the mountains of NC and Tennessee so I was shocked when we moved out here 6 years ago with the natural beauty of this whole area and how much I’ve fallen in love with this area. That is why it is so surprising to me that you were able to find enough negatives to outweigh the positives in this area. While I understand this conversation was years ago, I must say it has influenced my decision to come to Sedona. I lived in Arizona, have visited both Sedona and Jerome before. But to see a “representative” of Sedona take this approach to reproach a reviewer is beyond offputting. To assume the average traveler is not smart enough to read multiple reviews or get information from various sources is insulting. And to be so insecure of what you offer that you feel the need to attack someone offering their honest opinion is more telling than the review itself. Honesty and having the backbone to give a true review is so refreshing. Thank you for the honest review. As a lot of posts concur its not just the OP who does not appreciate Sedona proper, its a lot of people I talk to including my outlaws who live there. We live in Phoenix and stay in our MH in Thousand Trails every couple of weeks. Been there and have done everything the town has to offer, a tourist trap by any other name. But a real pretty tourist trap to be sure. Sedona is all about the nature and not about the shopping. We did mention in the post about the trails etc as we did that. However even hiking the number of people you run into on the trails does not make it very “nature” like. When you are off road and run into a tour of jeeps, well, that is not what we surely came for. :) So yes, great views and if you can find the quiet areas, it is wonderful. 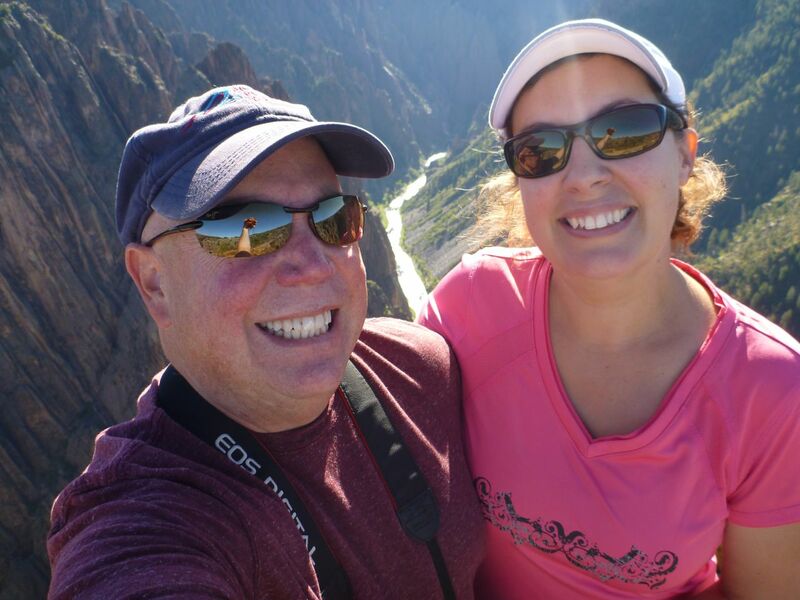 We stayed in a Camp Verde RV Park last year and ventured out to explore Sedona, Jerome, and Cottonwood. We wandered around Cottonwood and really enjoyed the town. Seemed like a down-to-earth place. We even bought a small glass ‘cactus’ as a souvenir at one of the stores (while waiting for the Desert Diamond Distillery to open). The “Adventures Unlimited” bookstore was also fun to peruse. They have books you just don’t see at local book stores. Kinda like stuff Art Bell or George Noori would talk about. Sedona reminded us of Marin County, CA. By that I mean, its ‘cosmisisity’ (a word I just made up to describe Sedona). lt means it’s “cosmic”, and we’re not into it. BUT, the scenery going in and out of town is nothing short of spectacular! We did some mild hiking but nothing serious. We weren’t prepared for that. There seems to be a few bucks living in that town . . . Since we’re from Carson City, NV (and only a few miles from Virginia City), we were somewhat underwhelmed with Jerome. We felt it was Virginia City on steroids. However, the glass blower, who gives free demos, was fascinating to watch. I have lived in and worked in sedona and in the outlying areas ffor 10 years…the trick is to not go to the tourist spots. Ask the locals….there are some of the most beautiful spots in rhe world….best with a picnic lunch or great bagels in the morni g at Ny Bagels (and no i donnt work there) best to have dinner in surrounding towns….better bang for your buck. One mightt remember that the tourist business is for international tourism as well its a big load on a a small town. Next time ask the locals where to take a picnic to on the creek …….you will understand what the rave is all about. There were years where all I knew of Sedona were the shops and galleries like Tlaquepaque. It was fun but what I didn’t know were the Sinagua ruins with easy hikes into those dwellings (but some long drives over gravel roads). There are also petroglyphs that are interesting to see. For those who head back toward the freeway, there is a road that leads to Sacred Mountain and below it a big site of petroglyphs. For those interested in such, those are places that I most enjoy spending time when in the Verde Valley. It is full of places from those who came before. Our experience mirrors yours completely. The “town” of Sedona was rubbish. Full of t-shirts, crystals, posters and people trying to sell you jeep tours. It wasn’t just one or two places either it was every one of them “in town.” We did like “old” Cottonwood and Jerome. The area is beautiful but the town doesn’t add anything to a visit. What shame. I understand how you feel about Sedona. 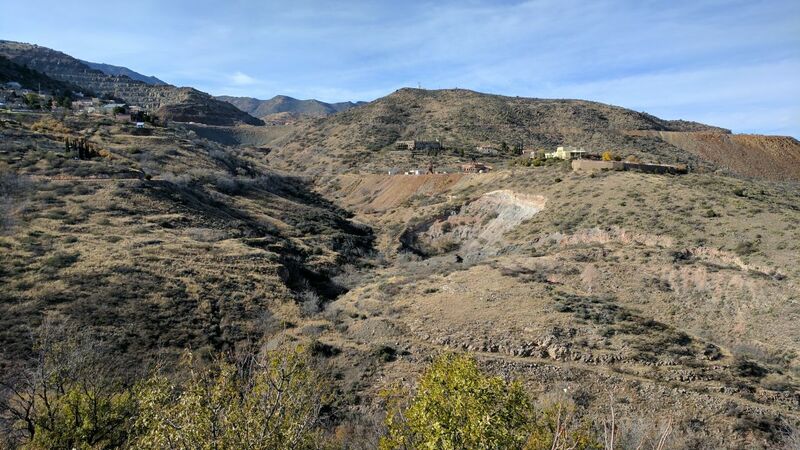 If you liked Jerome – you will LOVE Bisbee! We stayed at the Queen Mine RV Park and walked all over town. I know Tombstone is touristy but not like Sedona – at least we really enjoyed Tombstone. Especially loved staying at Wells Fargo RV Park right near the center of town. If we go to the Sedona area we generally stay in Camp Verde at Distant Drums RV Resort. The only reason most people go to Sedona is to get a tour of the countryside or stop at a restaurant. I hope you guys get to see Bisbee & Tombstone! I have to totally agree with your opinion regarding Sedona. I have visited at least 20 times with my first visit being in the 1970s when I lived in the east and vacationed in AZ one spring. It was serene and natural and had wonderful artisans. My most recent visit was last November and I couldn’t believe the tackiness I felt this time. I commented to my granddaughter several times how commercial it was now. The scenery is stunning, but the overall feel was touristy. I will definitely go back someday since I live in AZ now, but I won’t feel like bragging about how great it is to family or visiting friends anymore. Such a shame. Being a professional photographer, I love the Sedona AREA. Forget the town and get out into the surrounding areas. I have captured some of my most favored landscape images in the Sedona AREA. As mentioned above by another poster, Schnebly(sp) road is a gem of beautiful landscape photograph possibilities. I sell my photographs and have been suitably rewarded. We usually park our motorhome in the small park at the foot of Schnebly road while there, or sometimes down at Distand Drums south of the Sedona turn off. very nice and clean park. We then take the jeep and go explore. Every time we go we check with locals and go to a different area and discover additional riches of beauty to capture. We will continue to visit as often as time and energy will allow! I think you wrote a honest appraisal of Sedona, the same as what we found visiting last November. It is a beautiful place, nice people, but put us off as a bit touristy. We enjoyed Cottonwood and will be returning there in June to look at the area closer, real estate. We have considered relocation somewhere between Sedona-Cottonwood-Verde Valley. Retiree in a place to call home, not a vacation/tourist spot. I would visit Sedona again, if I were a resident of Cottonwood. But would prefer Cottonwood area as a residence. We were in Panama City, Panama in 2016 for 3 weeks. A condo neighbor there was from Cottonwood, visiting Panama. Very nice people, made me interested to visit there. We live in Washington State, north of Seattle. Lived here all our lives, raised our kids. A beautiful state full of natural wonders. The growth is booming with too many new people. Real estate is hot. There is a large exit of retirees from WA. It is not a income tax state, however our property taxes have become excessive, like a state income tax. We would pay less in overall state income/fed taxes in a comparable home in Arizona, Idaho and other income tax states. Don’t be fooled by a no state income tax. WA has the second largest gas taxes in the nation, with some of the worst local roads. Transportation taxes going to Seattle, state tax dollars into $5bn tunnels, ferries, endless social programs. Traffic is a nightmare, like LA with rain and clouds. We also have a REET real estate excise tax when you sell of 1.6%, found only in a few other states, but not in AZ. Many more new taxes being proposed, with little solutions. A proposed mileage tax as well. No real senior or retired exemptions, unless you are in poverty or a drug addict. We have enjoyed WA years ago and wished we could remain here. It’s has become expensive and oppressive to live here. Time to go. Need we forget that the feedback given is completely subjective. I on the other hand thank you for all the feedback and comments on Sedona and Jerome!